​The Algonquin named him Eskimantik . . . eater of raw flesh. With primitive tools the Eskimo scraped an existence in the barren, frigid ice fields of the North. He depended on nobody, making use of fur, meat, oil and bones of the seal. A cold and lonely way of life that is part of Canadiana. ​Long before the white man came, with his new ways, the Indian lived off the bounty of the land. Across the plains, in forest groves and by the coastal shores. Proud, friendly. Content with his way of life. Unaware that an era was passing, that a difficult future lay ahead for his people - the first Canadians. They brought their nets and fishing skills to the new lands. For a growing nation must be fed. Stout boats and brave crews searched the sea. When the men were away, families waited anxiously. Usually the boats returned with heavy holds. Sometimes empty. Others never returned. ​The ocean anti Inland waterways were the lifeblood of a new and expanding nation. Along the Eastern seaboard hand-hewn timbers took form. 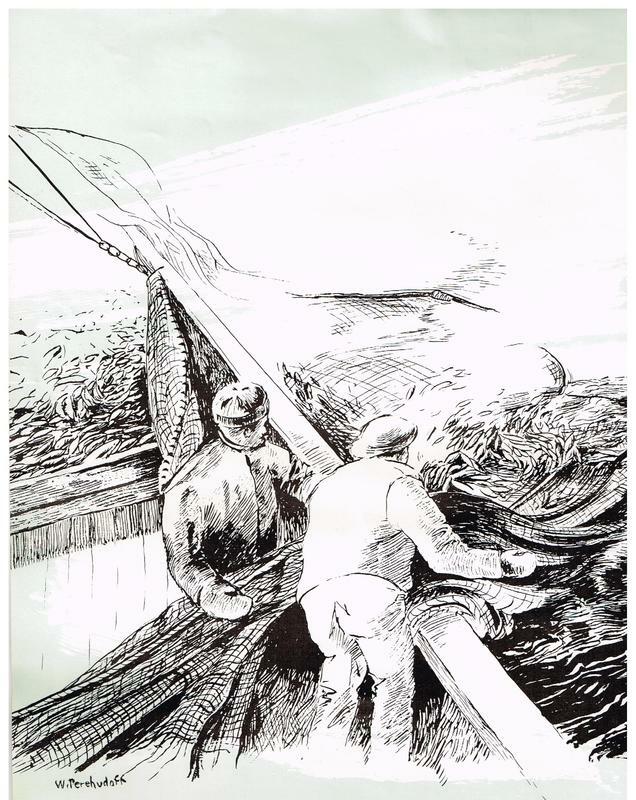 And down to the sea in their schooners and yawls and dories went the sailors and fishermen. The skills and tools of the boat builder played their part. And Canada grew and prospered. ​From other soils they came, bringing with them the customs, language and native dress of their homeland. Soon the new areas bore names from the past, from far away. As the settler looked out across his flock he felt a touch of loneliness but much confidence in the future of this new land which he would help to build. Flowing rivers mid boundless woodlands gave promise of thriving forest activity. Soon the air rang with the sound of axe and saw. Timber fell. Rivers swelled with logs tumbling swiftly down to the waiting mills. 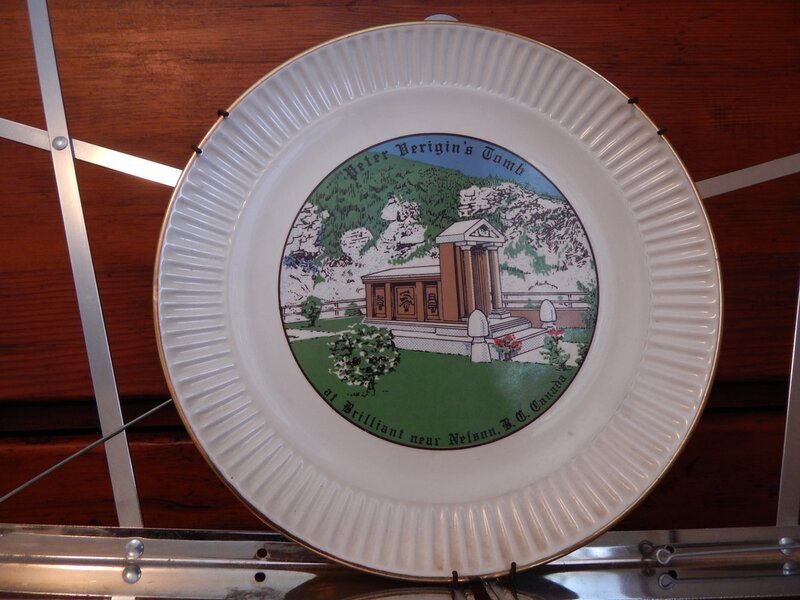 For the people there was a new prosperity. New security. A part to play in the destiny of a nation. He was called coureur des bois . . . runner of the woods. Across the frozen north land, through fields of snow, the trapper toiled. Setting his traps, transporting his harvest of furs, making possible the birth of the first trading establishments in this new and abundant land. Youth make the nation. And to the school teacher in the one-room school house went out the challenge of the times . . . to educate, direct and discipline a young Canada. They taught well. From their classrooms came men and women . . . the leaders who were to guide a new country to its future. ​They came from miles around to do the "neighbourly" thing - a helping hand at harvest time, the raising of a new barn. Working together and when it was finished - celebrating together. The Red River flowed swiftly by as neighbour helped neighbour through these difficult pioneering days. On a vast and lonely prairie the early settler built his home of sod, worked the land with horse and plow. Others came. One by one, then in clusters. Families followed. Then, from over the seas came the multitudes, until the endless horizon was spotted with thatched roofs—the first prairie communities. ​Amid the bellow of cattle, with rocky peaks rising in the background, men drilled. Soon the range was dotted with spires of wood and steel. The depths of the earth discharged its oily wealth that men might attain industrialization. Cattle grazed on contentedly, indifferent to the exciting changes around them. 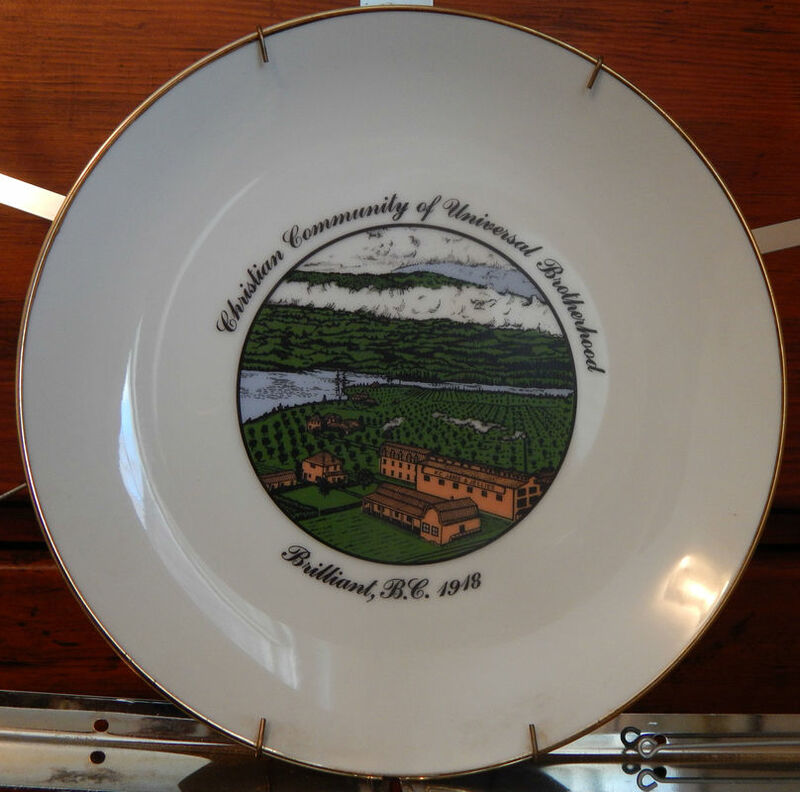 ​In Canada’s Centennial year, 1967, the CO-OPERATIVE LIFE INSURANCE COMPANY commissioned one of the most famous Doukhobor artists, William Perehudoff, to illustrate their commemorative calendar. 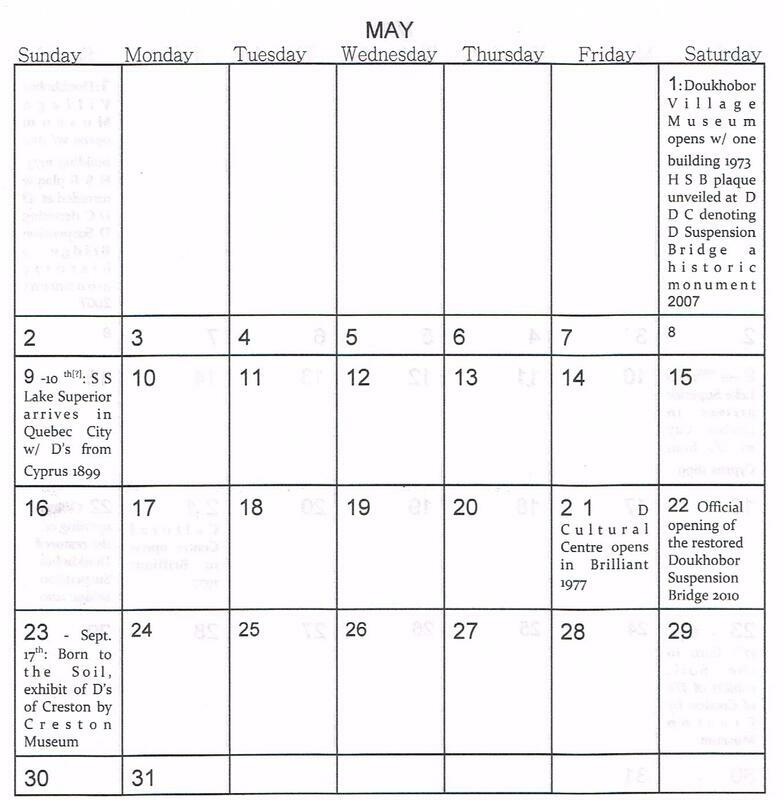 Since we have just competed our 150th year of confederation, I thought it appropriate to reprise this historical calendar by one of Canada’s leading artists. 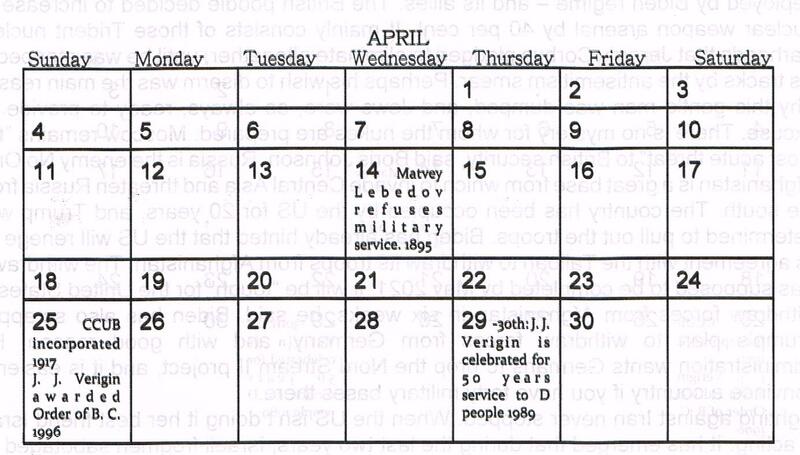 Thus, this year’s Doukhobor historical time line calendar will feature these monthly sketches along with the text of the time. William Perehudoff, [1919-2013], born at Langham, Saskatchewan, studied at the Colorado Springs Fine Arts Centre and with Amadie Ozenfont in New York, attended Emma Lake Workshops under Barnet, Cherry, Greenberg and Noland and studied graphic arts processes at the Carnegie Institute of Technology, Pittsburgh. He was represented in the sixth Biennial of Canadian Painting and the “Jubilee Exhibition". Exhibitions include The Canadian Society of Painters, The Saskatchewan Society of Painters, The Montreal Spring Shows, The Saskatchewan Arts Board Shows, The Colorado Artists Guild and The Winnipeg Biennial Exhibition. He was also presented the Gold Medal of Achievement at the Banff Centre. Across the mountains to the final tie, the last spike, the railroad was a symbol of the vitality of early Canada. Mile by mile, rail by rail, the path of the iron horse was fashioned, demonstrating the determination of a country to become a nation—to link its shores and make Confederation possible. COLLAPSE OF THE C. C. U. B. There is no doubt that Peter Verigin's death marked the beginning of the end for the Christian Community of Universal Brotherhood. Trying to expand when they should have been conserving, the management took out loans and put the corporation into jeopardy by allowing the entire holdings as collateral. A combination of reduced markets due to the depression, shrinking membership and losses through unsuccessful investments as well as continuing arson saw the community sink into the vortex of economic collapse. The C.C.U.B. Trust Fund is the financial remnant of the once flourishing Christian Community of Universal Brotherhood. 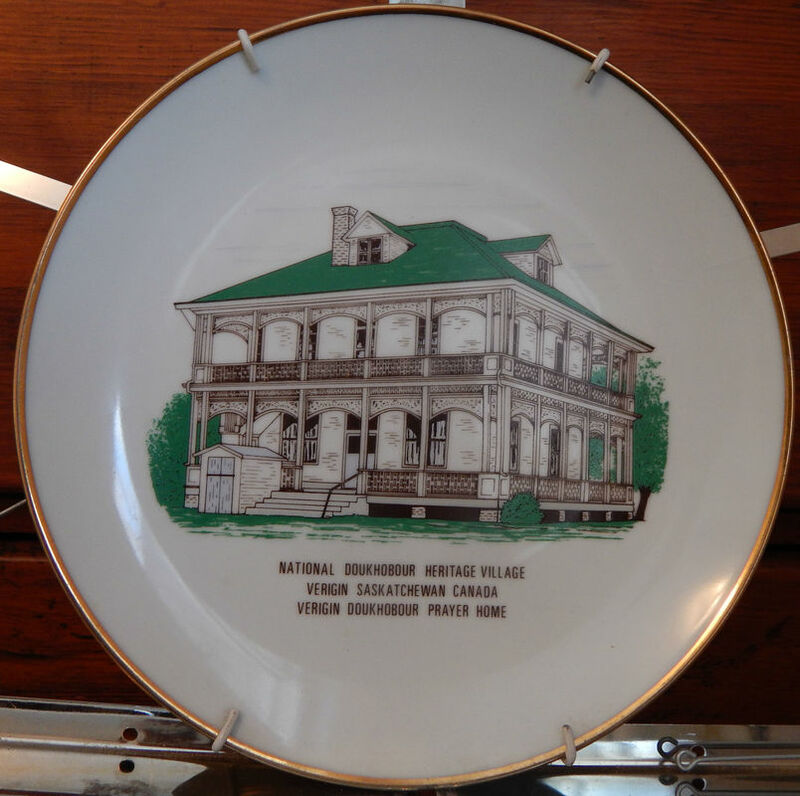 Brought to its knees in 1938 through foreclosure action, some resources of this one time exceptionally successful communal enterprise, the largest in North America, remained as a legacy to the present day Doukhobor societies. After the devastating foreclosure action by Sun Life Assurance, the Canadian Imperial Bank and Crown Life over the outstanding $300,000 interest owing, the B. C. government negotiated a settlement by paying $280,000 on the debt, and thus became owners of the entire C. C. U. B. holdings. 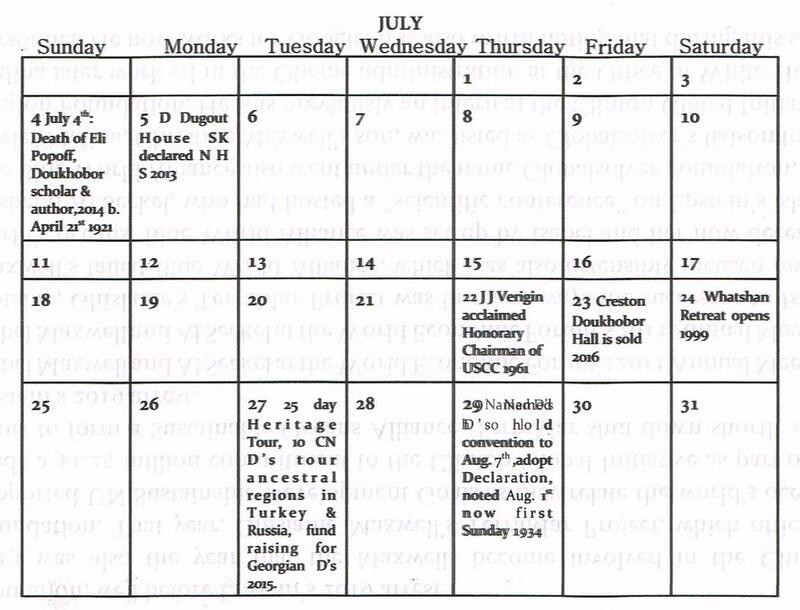 In June of 1980, the Doukhobors of Canada C. C. U. B. Trust Fund was proclaimed by the Government of Saskatchewan. 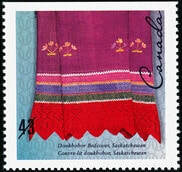 The stated intent of the fund was to further the culture and heritage of the Doukhobors in Canada. Now the interest from the remaining fund is doled out yearly to various applying Doukhobor societies. Doukhobor Andrew Gritchen, 3rd from R, directs Italian stone masons from Trail constructing the tomb. In the only address at the grave side, business confidante and friend Max Baskin said, in part; "Verigin died, but his work will never die. His memory will live in your hearts and your deeds. Remembering his ideal, you will go forward in the ray of progress on the well made path which he has led you to follow." 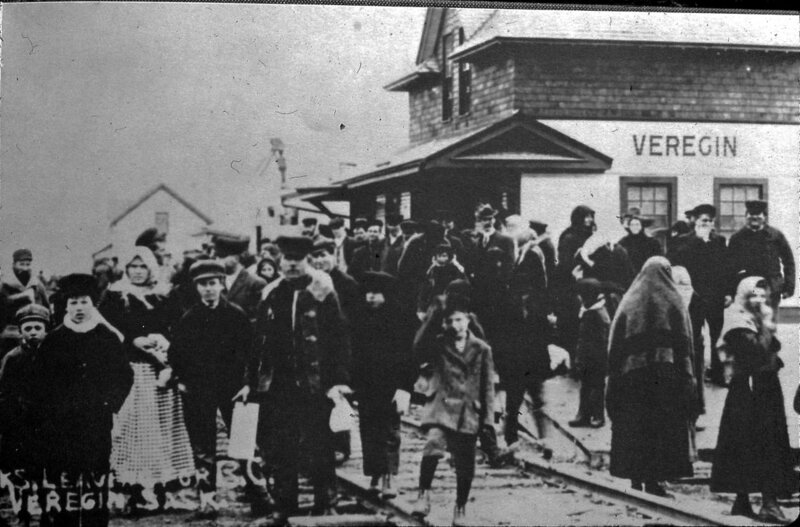 Between 1908 and 1913, over 5,000 Doukhobors migrated to the Kootenay and Boundary area of British Colombia. The initial settlement was called Dolina Ootishenie, the Valley of Consolation, so named by Peter Verigin. This is the largest migration ever within Canada and in 2008 was declared a National Historic Event, achieved while I was Curator at the Doukhobor Discovery Centre. The Christian Community of Universal Brotherhood incorporated in 1917 under Dominion charter and capital at $1,000,000. Land purchases began with the 1908 initial purchase of 2,800 acres at Ootishenie. By 1924. this had grown to 21,648 acres in British Columbia and nearly 50.000 in Alberta and Saskatchewan. 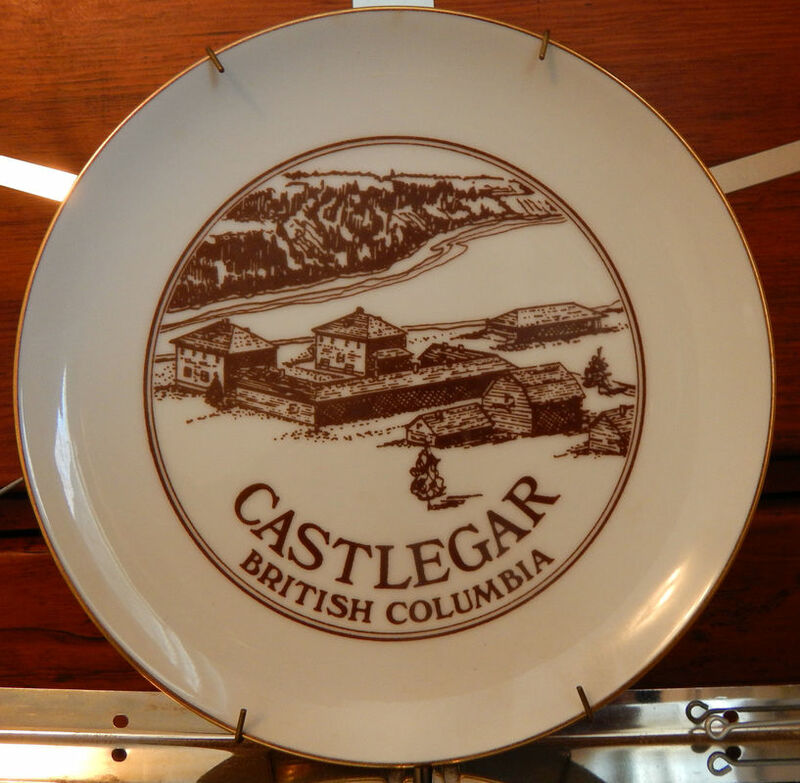 The Doukhobors were the founding pioneers of the area near Castlegar, which had a population of about 200 when they arrived. 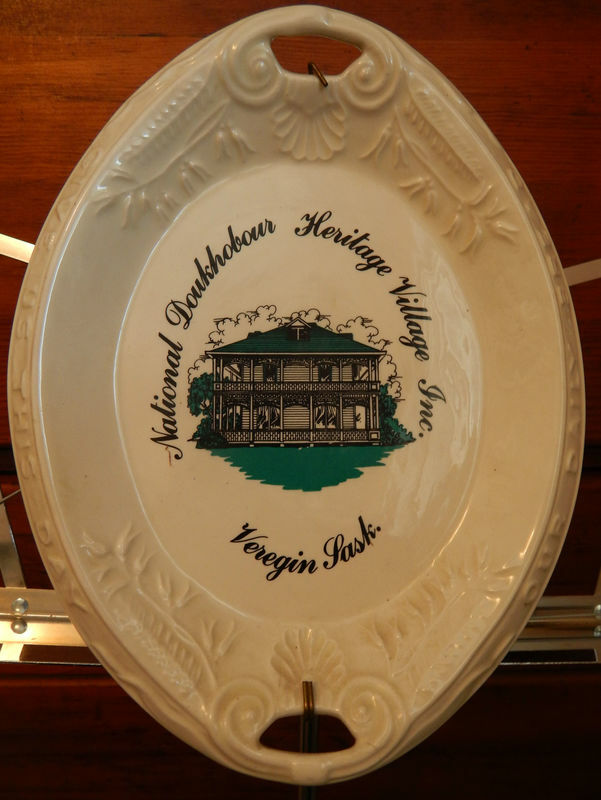 Doukhobors' achievements in this second 'golden period' were many. Outstanding accomplishments included the famous Kootenay-Columbia Preservation works and many industries such as lumber mills and brick yards. They built roads and bridges. concrete reservoirs and irrigation facilities, and planted tens of thousand of fruit trees. 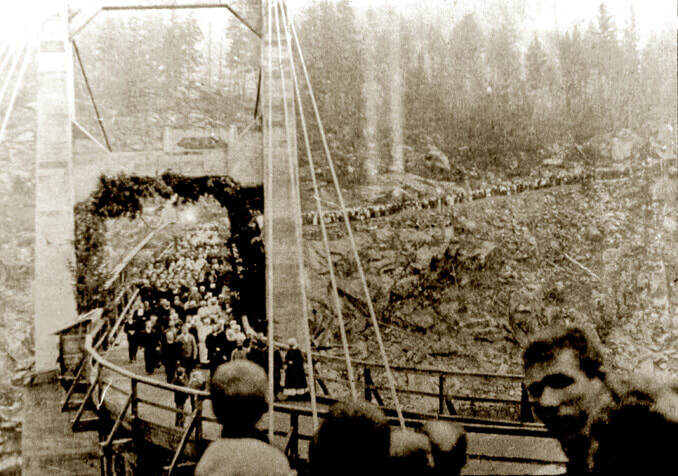 In 1913 they built the famous Doukhobor Suspension Bridge near Castlegar, now a designated Historic Site of Canada. With rumours of impending homestead cancellation and eviction from their hard won settlements, the Doukhobors were once again in a state of anxiety and confusion as to their future. Peter Verigin announced that he had been successful in negotiating a land deal in British Columbia, where the climate was milder and fruit could be grown. If they bought the land, they would not have to swear the oath of allegiance, and they could continue to live communally. Meetings were held in all villages and about two thirds of the Doukhobors resolved to move. Between 1908 and 1913, over 5,000 Doukhobors arrived in the Kootenays where they pioneered a new land and became the founding, primary settlers once again. In 2008, thanks to this writer, this move was proclaimed as an event of National Historic Importance by the Federal government. Peter V. Verigin was also declared a Person of National Historical Significance. 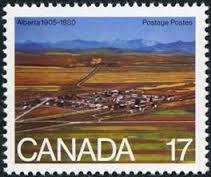 Settlement in Assiniboia developed quickly and by 1902 resulted in 62 villages and cultivation of over 250,000 acres. The Canadian government provided three reserves in what is now Saskatchewan totalling some 750,000 acres for Doukhobor occupation. To accommodate communal settlement the 'Hamlet Clause' allowed them to satisfy the residence requirements of the Dominion Land Act. This ended in 1907 when the new Minister of the Interior, Frank Oliver, cancelled the Hamlet Clause in favour of enforcing the Homestead Act. The new regime also required an intention to become a citizen which meant swearing the oath of allegiance to the Crown and paying a registration fee. Taking such an oath to 'defend the king' was a requirement that would have changed the Doukhobor migration plans had they heard about it before coming to Canada. Now, most, of them thought that such an oath would lead to a negation of exemption from military service. On June 1, 1907, the new regulations were enforced and some 2500 homesteads were cancelled representing approximately 300,000 acres of improved land. Once official word was received that negotiations had been completed satisfactorily with the Canadian government, Doukhobors embarked for Canada from the port of Batum. On December 6, 1898, a Canadian Order in Council exempted Doukhobors from military service under the Conscientious Objector Act which Canada had previously enacted for the benefit of Quakers, Mennonites and Tunkers. Other conditions negotiated were: 'land in a bloc' and 'control of internal affairs'. With these conditions agreed upon, the Lake Huron and the Lake Superior, commercial ships converted for passenger use, each made two trips. Approximately 7,500 Doukhobors arrived for settlement in the Assiniboia Territory of Canada between December 23, 1898 and June 21st, 1899. 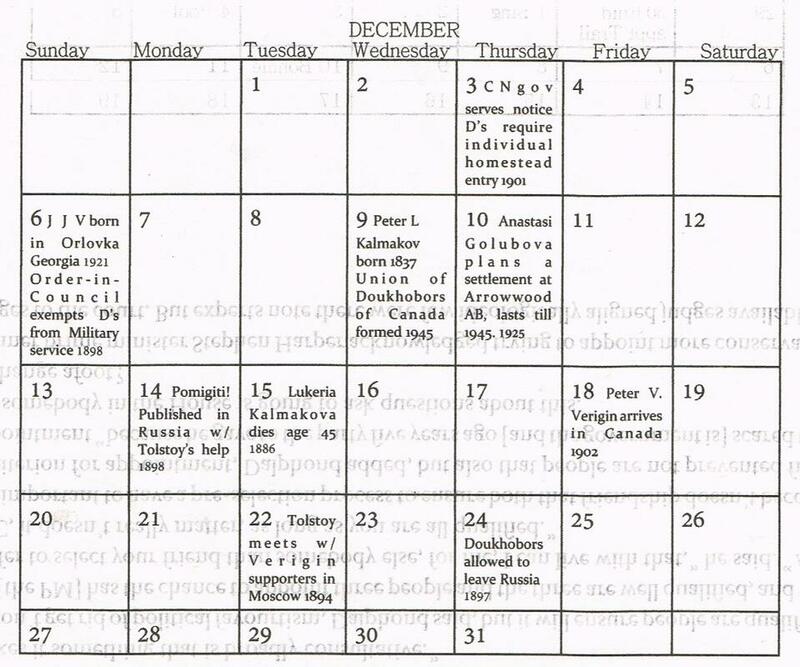 Prince Peter Kropotkin was visiting James Mavor, Professor of Economics at the University of Toronto, when a letter came from Leo Tolstoy explaining the plight of the Doukhobors and their search for refuge. Kropotkin had travelled through western Canada in 1874-78 and was impressed by the Mennonite settlements. He suggested that the Doukhobors, the best farmers in Russia according to Leo Tolstoy, would do well in the mid west. Mavor then wrote to Clifford Sifton, Minister of the Interior, who was conducting an aggressive campaign to settle the west. He felt that these agrarian toilers would be perfect immigrants for settling the virgin prairie. Their communication eventually resulted in the agreement to welcome the Doukhobors to settle in the Northwest Territories, agreeing to their requisite conditions. 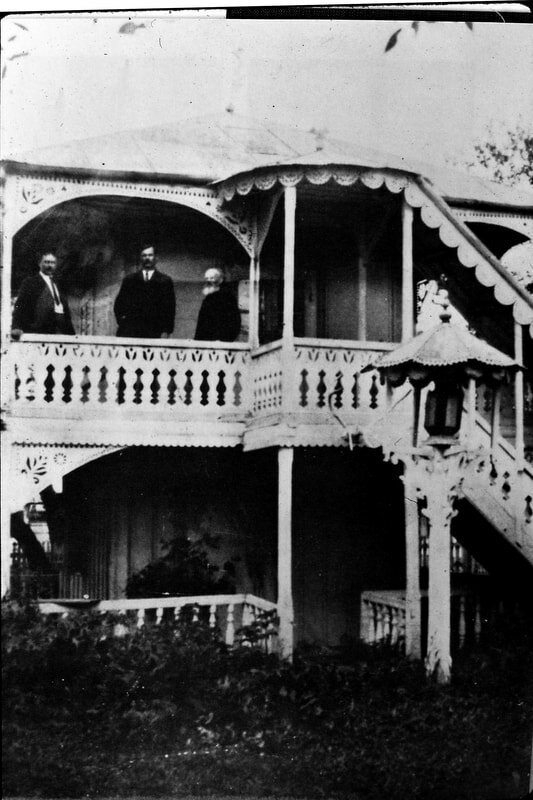 Led by the prestige and influence of Leo Tolstoy, a committee was formed to aid the Doukhobor emigration cause. 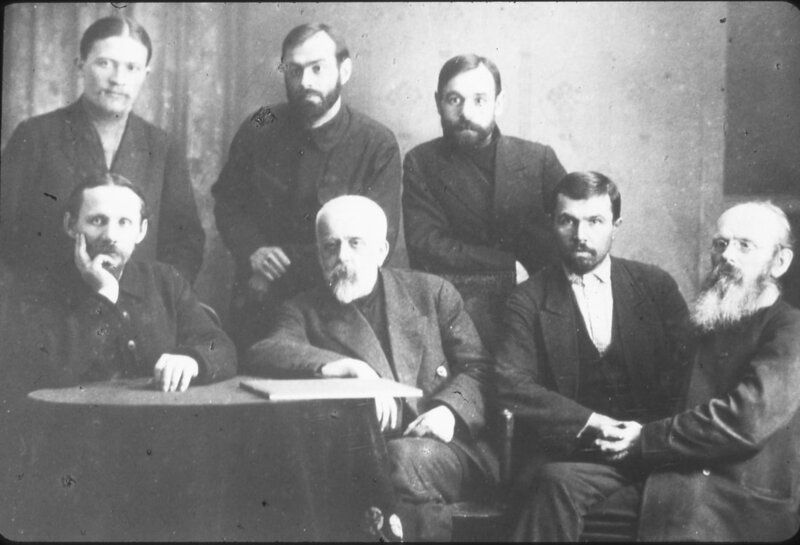 Key members included Pavil Biryukov, Vladimir Chertkov, Ivan Mikhailovich Tregubov, Prince Khilkov, Prince Peter Kropotkin, Leopold Sulerjitski, and Gorbunov-Pasadov. 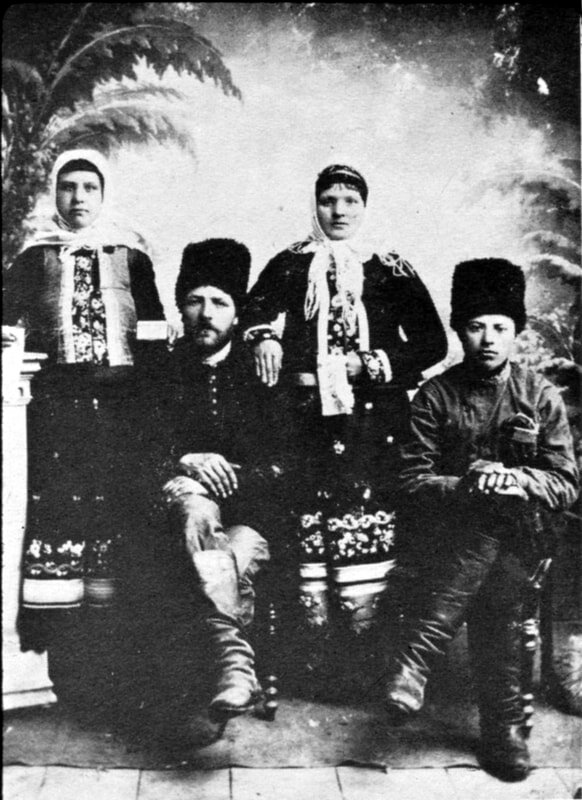 As a group they brought world wide attention to the Doukhobor cause, eventually pressuring the Russian Imperial government to allow the migration of the Doukhobors. The conditions were: they must leave immediately, pay their own way, and promise not to return. The committee raised necessary finances, chartered the ships and played an active role until the move was completed. Sulerjitski accompanied the first ship, the Lake Huron, to Canada and assisted them in the first settlement. His diary was later published as To America With the Doukhobors. Sergei Tolstoy, Leo's oldest son, also came to Canada as facilitator and interpreter on the second ship, the Lake Superior. Memoirs of the event were published as SERGEI TOLSTOY AND THE DOUKHOBORS, A JOUNEY TO CANADA. Alarmed by reports of severe repression of the Doukhobors after the 1895 Arms Burning, Leo Tolstoy sent Pavel Burikov to investigate. This resulted in the publication; Christian Martyrdom in Russia, edited and distributed by Vladimir Tchertkoff. World wide publicity aimed at the Russian government resulted in pressure to allow the Doukhobors to emigrate. Tolstoy, alongside Chertkov, took up the Doukhobor cause in earnest. Devoting the royalties from a hastily completed novel, Resurrection, and some other stories, and soliciting donations from wealthy acquaintances, he raised 30,000 rubles, about half of the total emigration costs. To this day he is revered among Doukhobors as their saviour in dire time of persecution. Tolstoy was a confidante and correspondent of Peter Verigin from 1895 to 1910. In 1897, amidst speculation that he would be nominated for the Nobel peace prize, Tolstoy wrote the newspaper in Stockholm, declining such nomination and suggesting that the Doukhobors be nominated instead. He admired them as living an ideal life close to his own beliefs and having the courage to implement two basic Christian beliefs: Resist not evil, and Thou shalt not kill. In 1895, acting on instructions secretly conveyed by Vasili Verigin and Vasili Vereschagin from Peter V. Verigin, who was in exile in Siberia, the Doukhobors burned their weapons in three separate areas of settlement as a mass protest against institutionalized murder. 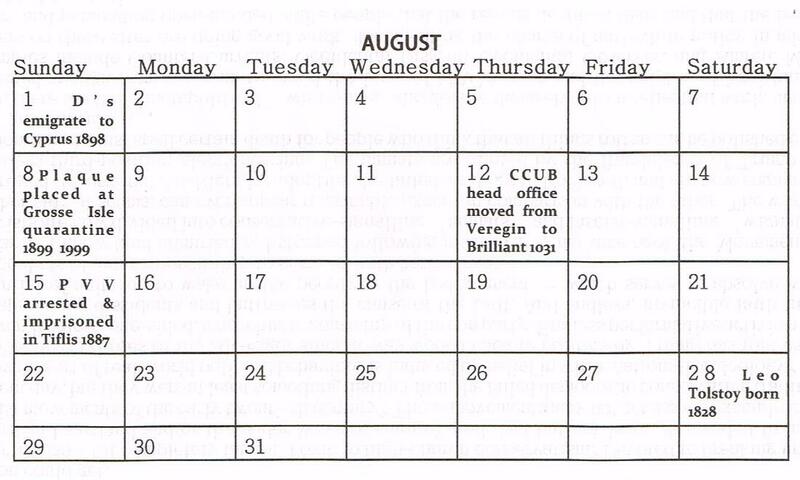 This greatest ever pacifist demonstration occurred at midnight on June 28-29, Peter V. Verigin’s birthday, in three major settlement areas: Elizavetpol, Kars and Bogdanovka. This pacifist demonstration resulted in severe persecution by the authorities resulting in the death of approximately 10% of the Doukhobor population through incarceration, torture and exile. 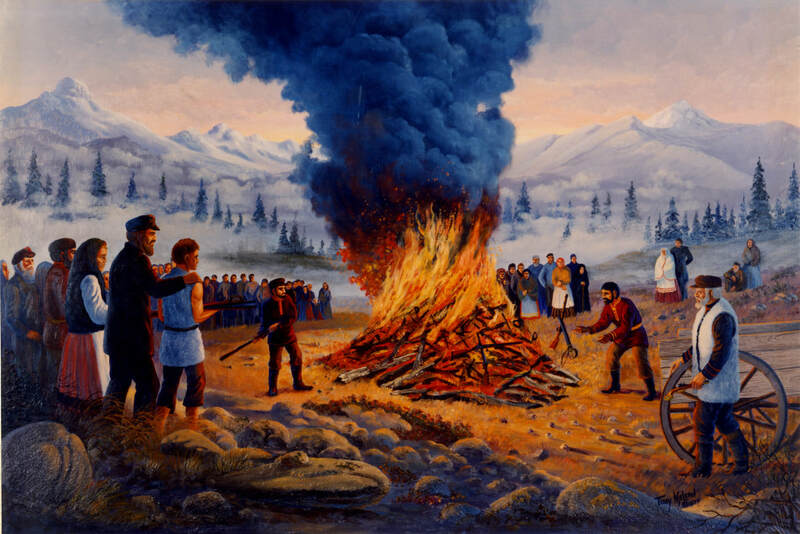 *This painting by Terry McLean illustrating the event was commissioned for the cover of The Hope and the Promise, a novel, and was donated to the Doukhobor Discovery Centre by the Ewashen family. Throughout his exile of 16 years, Verigin read widely and corresponded with some of the leading intellects of the day, sharing worthwhile principles through his writings. ​​In 1864 the riotous Doukhobor leader Peter Kalmykov died of an illness contracted while hunting. Normally, the role of leader would have gone to his son. However, he and his wife Lukeria, who he had married at the age of twenty [she was sixteen] in 1856, were childless. His deathbed wish was that the new leader would be his wife, "my little cuckoo". The "little cuckoo", Lukeria Kalmykova, soon grew the wings of an eagle and became one of the most successful and dynamic leaders of the Doukhobors for 22 years; in what came to be known as the "golden age of Doukhobor history". [As Russians, the Doukhobors were not unaccustomed to rule by women, having had four tsarinas in the eighteenth century].